Adding depth and dimension to your light show. The Martin Magnum Hazer gives your light show outstanding refraction with an effortless ease. 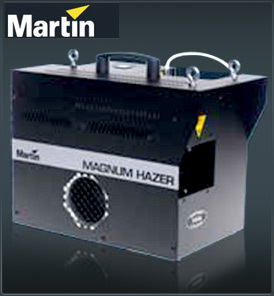 Incorporating some of the most complex technology behind the simplest interface, the Martin Magnum Hazer is one of the most effective, mid-sized haze solutions available today. Employing the latest in innovative ECO-Mass vaporizing system design and VGA (variable geometry airflow) it is capable of producing very small highly refractive airborne particles to deliver the perfect, optically translucent canvas of haze. The compact and rugged design makes it the perfect tool for all professional applications ranging from theatre and television to large-scale clubs and tours – in fact any event where a truly reliable hazer is needed to create a light-enhancing canvas of water-based haze for long periods. The 3-digit LED user interface and state-of-the-art digital electronics gives you complete access to DMX set-up, density and output control, allowing you the choice of either continuous operation or precision digital timing. The amount of haze dispensed can be adjusted via on-board fan speed control and haze output control, and a variable temperature control enables users to utilize different Jem fluids for different effects.